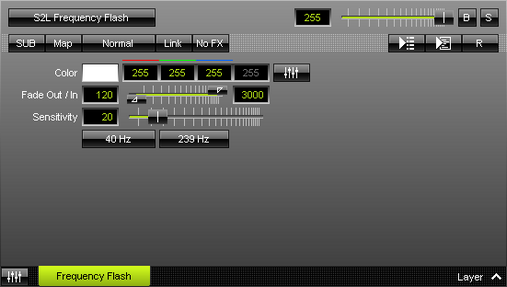 S2L Frequency Flash analyzes the audio input for certain frequencies and flashes the LED matrix when such frequencies occur in the audio input. ▪ Fade Out / In - Defines how fast MADRIX flashes [in %]. You can specify the fade-in speed as well as the fade-out speed. This value represents Beats Per Minute [BPM]. The default values are 120 and 3000. Valid values range from 1 to 3000. ▪ Sensitivity - Defines how quickly and accurately MADRIX reacts when such frequencies occur [in %]. The default value is 20. Valid values range from 1 to 100. ▪ Defines the lower limit of the analyzed frequency spectrum. If a frequency in this range occurs, MADRIX will flash the matrix. ▪ Defines the upper limit of the analyzed frequency spectrum. If a frequency in this range occurs, MADRIX will flash the matrix.